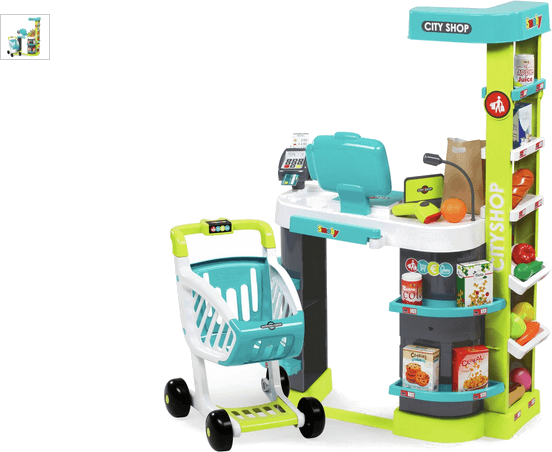 The Smoby City Shop provides little ones an authentic supermarket checkout experience. The impressive modern electronic till with life-life lights and sounds, as well a built-in fruit and vegetable scale, microphone and credit card reader to take the customers payments enables your most cherished to get their creative juices flowing. Stack the included play food and groceries displayed on the numerous shelves in the shopping trolley, meander over to the checkout and then scan with the wireless light and sound electronic barcode scanner before settling your bill with pretend money, to be deposited in the cash register or use the credit card reader if you're short on time! Get money off with April 2019 free Argos voucher codes, see if there's a promo code for the Smoby City Shop product. Argos may be out of stock of this product. To enhance your shopping experience you may also be redirected to a search results page when you click an outbound link.